From now through 11:59am EDT tomorrow, you can head over to the Motorola website and purchase the first-generation Motorola Moto G LTE for just $159.99. That is a $40 discount from the regular $199.99 price of the handset. Motorola recently released the second-generation Motorola Moto G LTE, which is probably why the manufacturer is willing to get rid of the first-gen model so cheaply. The first-generation Motorola Moto G LTE is equipped with a 4.5-inch screen carrying a 720 x 1280 resolution. This works out to a pixel density of 326ppi. A quad-core 1.2GHz Snapdragon 400 CPU is under the hood while the Adreno 305 GPU is also inside, crunching graphics. 1GB of RAM is on board along with 8GB of native storage. If additional memory is what you need, you can always access the 32GB capacity microSD slot that is included. A 5MP camera adorns the back of the unit while a 1.3MP shooter is on the front of the phone so you can snap selfies and take part in video chats. A 2070mAh battery keeps the lights on, and Android 4.4.4 is pre-installed. The clock keeps ticking, so if you want to take advantage of this deal now, click on the source link before the buzzer sounds to mark the expiration of this special offer. 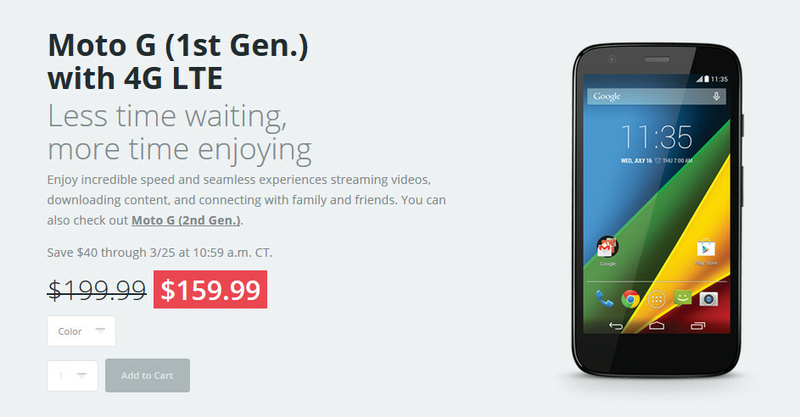 I wonder if they still have the 1st gen Moto X. I'd buy it for $159. I tried to redeem my warranty on the original moto x. They said they no longer had the parts for repair, so they replaced it with the 2014 moto x. There was a 100$ fee, but I was all for it. That was so worth it. NOOOOO!!!! I'm selling a new Moto G LTE on Ebay right now. Couldn't they have waited until Monday?